The last king to die on the battlefield in Britain was King James IV of Scotland at Flodden 500 years ago. He was the last in a long line of rulers - particularly north of the border - to meet their end in such a manner. It was once an occupational risk which came with ruling a nation. For centuries, a monarch was expected to lead troops into battle. Of course, that meant some of their number were in danger of losing their lives to the enemy. 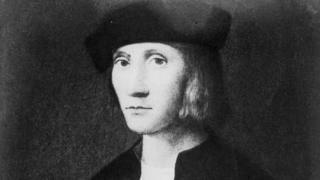 King James IV died at the Battle of Flodden on 9 September 1513. The Scottish king crossed the border with an army of about 30,000 men supported by artillery. His mission was to honour his alliance with France and divert troops from the main English army which was in France under Henry VIII. Thomas Howard, Earl of Surrey, gathered an army of about 20,000 to oppose him. The battle began in late afternoon on 9 September but it proved to be one-sided. "By nightfall the Scottish army was annihilated," records the Encyclopaedia Britannica. "James was killed, together with at least 10,000 of his subjects, including high officers of church and state and many nobles. "These losses - and the fact that James left an infant son to succeed him - took Scotland out of international politics for a decade." Dying in battle was, in fact, something of a tradition among the Stuart monarchs. James IV's father, James III, was killed in or shortly after the Battle of Sauchieburn as he tried to quell a rebellion near Stirling in 1488. His own son was part of that uprising. Their ancestor James II was killed during a siege of Roxburgh Castle in 1460. A cannon used in the siege exploded causing his death. Who were James IV and Henry VIII? Why did England triumph at Flodden? That run of three Scottish monarchs in a row to meet their end in battle was almost four. James V is thought to have suffered a "mental breakdown" after the Battle of Solway Moss in 1542 but did not die until shortly afterwards. The late 15th and early 16th Century were, indeed, bloody times for rulers on both sides of the border. Richard III was the last English king to die in battle, at the Battle of Bosworth Field in 1485. He was killed by the forces of the Lancastrian contender for the crown, Henry Tudor - the future Henry VII. Of his final moments, the Encyclopaedia Britannica recorded the king "was unhorsed and killed in the bog". The names of many of the kings killed in conflict remain famous to this day. Richard I of England, the Lionheart, died during a siege in France in 1199. A similar fate was met by William I, the Conqueror, who also suffered fatal injuries while fighting in France. His predecessor, King Harold II, had been killed at the Battle of Hastings by Norman invaders under William's command in 1066. There were also bloody connections north of the border between Malcolm III, Macbeth and Duncan I.
Macbeth took Duncan's life in battle near Elgin in 1040 before he, in turn, was killed by Malcolm in 1057 at the Battle of Lumphanan in Aberdeenshire . Malcolm would later die at the Battle of Alnwick in 1093. A number of other earlier Scottish kings also lost their lives in conflict. Kenneth III was killed in battle in 1005 at Monzievaird, Perthshire, by his kinsman Malcolm, who seized the throne. Scots King Indulf died fighting the Danes in 962, Malcolm I is thought to have been killed at Fetteresso, Kincardineshire, by rebels from Moray in 954 and Constantine I lost his life fighting Norse invaders in Fife in 877. The long-standing tradition of leading your troops in battle did not die out until quite some time after the last king was killed in conflict. More than 200 years after the Battle of Flodden, George II, at the age of 60, was the last British sovereign to take such a role, at the Battle of Dettingen in 1743 in Germany, against the French. Since then, no British monarch has run the risk of replacing the name of James IV of Scotland in the history books by leading their soldiers in conflict. Who was the real Richard III?